Quality focused and oriented approach has helped us in offering our patrons with a defect-free range of pumps at cost effective prices. For carrying out all the on-going quality testing procedures in the most efficient manner, we have appointed a huge in-house quality testing unit and appointed a team of quality controllers. Being a customer-focused organization, we are manufacturing and supplying a comprehensive range of superior-grade of Products. We work with the prime aim of attaining higher level of clients satisfaction and to fulfill this we stringently follow client-oriented approaches. Further, we manufacture the offered range in compliance with the international quality standards & norms. 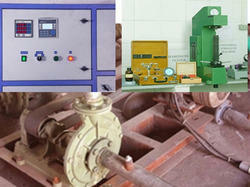 Our clients can avail these water pumps in various models and configurations as per their choice.